Gov. Mike Parson has announced State Representative Scott Fitzpatrick as the next state treasurer of Missouri. Fitzpatrick has been the chairman of the Missouri House Budget Committee. First elected at the age of 25, Fitzpatrick quickly rose in leadership to become one of the most respected members of the General Assembly on fiscal issues. According to a press release from Parson’s office, Fitzpatrick will soon be one of the youngest statewide officials in modern times. Fitzpatrick, of southwest Missouri’s Shell Knob, replaces fellow Republican Eric Schmitt. 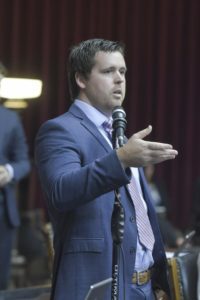 Parson has appointed Schmitt to serve as Missouri attorney general when Republican Josh Hawley assumes his position next month as Missouri U.S. Senator. Fitzpatrick, first elected state representative in 2012, represented Barry and portions of Stone and Lawrence counties. He’s the founder of MariCorp US., a marine manufacturing and construction company. Fitzpatrick graduated Cassville High School in 2006 and the University of Missouri in 2010. He currently lives in Cassville with his wife Mallory and two sons, Luke and Carson.